Marilyn Sawyer Gilbert entered life eternal on Thursday, February 7, 2019 surrounded by her family. She was greeted by her parents, Merlin and Virginia Sawyer and her brother, Norman Moody Sawyer and her sister, Yvonne Sawyer Walker who preceded her in death. Marilyn was born in Byron, Wyoming to Merlin and Virginia Sawyer. She was the third born of 5 children. She is survived by her two sisters, NaWana and Marlene. Marilyn enjoyed the outdoors and animals, spending time with her brother and three sisters on the M L ranch and 5 Springs near Lovell, Wyoming. She was a telephone operator for Mountain Bell Telephone Company where she met her sweetheart husband, Loyd of 64 years. They raised their family in New Mexico and Texas. Marilyn and Loyd moved to Arizona at retirement to enjoy their family. Marilyn tended many children over the years that she claimed as her own. She also loved the Priests of the Fairview Ward. She was a very talented cook, seamstress and homemaker. She was a cancer survivor and a support for many going through cancer treatment. 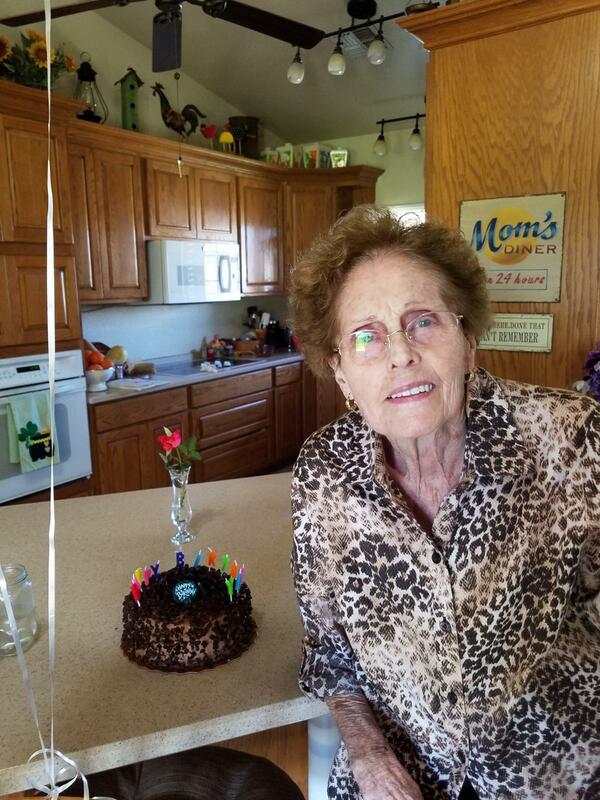 She enjoyed serving the Lord in many callings in the Church of Jesus Christ of Latter-day Saints, her favorite being early morning seminary teacher. Her legacy will be continued by her husband, Loyd and her children Gayle (Roy) Weatherston, Rosalyn, Les, and Lisa and 11 grandchildren and 16 great grand-children. She has two grandsons serving missions for the Church of Jesus Christ of Latter-day Saints, Elder Jarom L. Kay in the Eugene Oregon Mission and Elder Joshua Gilbert in the Mexico City Mission. To honor her memory, a viewing will be held on Tuesday, February 12, 2019 from 6 to 8 p.m. at the Bunker’s University Chapel, 3529 East University Drive, Mesa, Arizona. Funeral services will be held on Wednesday, February 13, 2019 at the Gilbert Arizona Williams Field Stake Center Temple View Building 3310 South Greenfield Road, Gilbert, Arizona. A visitation will be held at the church at 9 am prior to services at 10 a.m. Her final resting place will be the National Cemetery in Cave Creek, Arizona. I sure loved my Aunt Marilyn. She was such a loving and talented lady. I can still hear that precious laugh of hers. She will be deeply missed. Uncle Loyd, I love you and and your family and am keeping ya’ll in my prayers. Our family loved Marilyn and her family growing up. I’m saddened to hear the news of her passing and praying for peace and comfort for Loyd, Gayle, Roz, Les and Lisa and their families. You were a talented beautiful woman Aunt Marilyn you are so loved, and will be so missed, sending my love to Uncle Loyd and the kids, forever in my heart!! Marilyn was a wonderful friend and “Mama Marilyn” to my kids. We will all miss her and our hearts and prayers are with Loyd and all of you. We shared so many good times through the years and I will always cherish these good times with loving and special thoughts of Marilyn. May each of you find comfort and peace in the days ahead. Love you all.. Words fail me as I try to express my condolences for your sweet wife and mother. She came into my life at a tender time when I needed her sincerity, honesty, kindness, and happiness! One of the last things she said to me was “have fun and be happy!” She was an example of both of those things and more. May you always feel her with you.